Thanks to a generous sponsorship from Municipal Accounting Systems, the first 50 t-shirt orders this year are just $5 each! These are very high quality t-shirts, so take advantage of this bargain and order yours soon! After the first fifty orders are received, the t-shirt cost will go up to $15 each. Many thanks to Amanda James, Dan Krutka, John Knight and other members of our EdCampOKC organizer team for working hard to develop and approve this design for EdCampOKC 2015! Also remember if you haven’t submitted our online “Meet the EdCampers” form yet, we’d love for you to. This is a great way to connect with other EdCampOKC attendees and let others know about your educational background as well as interests before EdCamp. 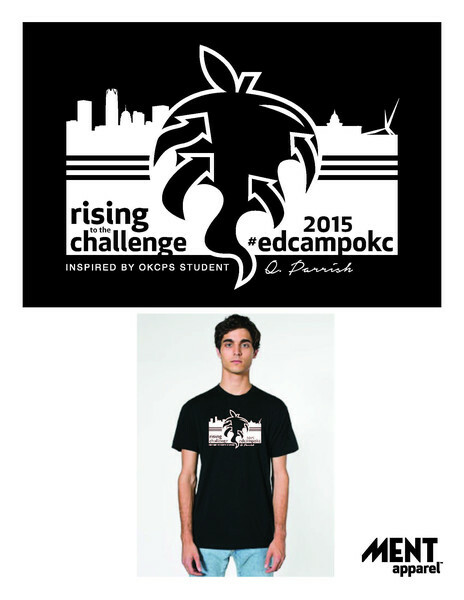 This entry was posted in 2015, news and tagged edcampokc, order, shirt, tshirt by Wesley Fryer. Bookmark the permalink.